Wear our Tusk Defender™ colors and join Tusk Task Force’s #RaiseTheShieldForWildlife Campaign to fund #TheHeroesThatCareForgot™ program: Providing tactical resources and gear to all park rangers fighting against poaching worldwide #SoThatWildlifeMayLive. WHEN YOU RAISE OUR SHIELD, YOU GIVE US REP AND DEFEND WILDLIFE. A WIN-WIN. Tusk Task Force has only two funding programs to sustain our ranger protection operations. Plus, all of proceeds benefit The Heroes That Care Forgot™— so the less they worry, the better they are able to defend wildlife. The evidence is compelling that wildlife poaching is a revenue stream for all illicit enterprises affiliated with worldwide terrorism. While there are many strategies to combat poaching and diminish the wildlife trade, we focus on one area of concern: The welfare, safety, security, and protection of those defending the African Trifecta (elephants, giraffes, okapis, and rhinos) — the Bush Rangers on the ground. Our two sustaining funding projects are focused on the park rangers deployed in many areas, managed by other NGOs and government agencies. 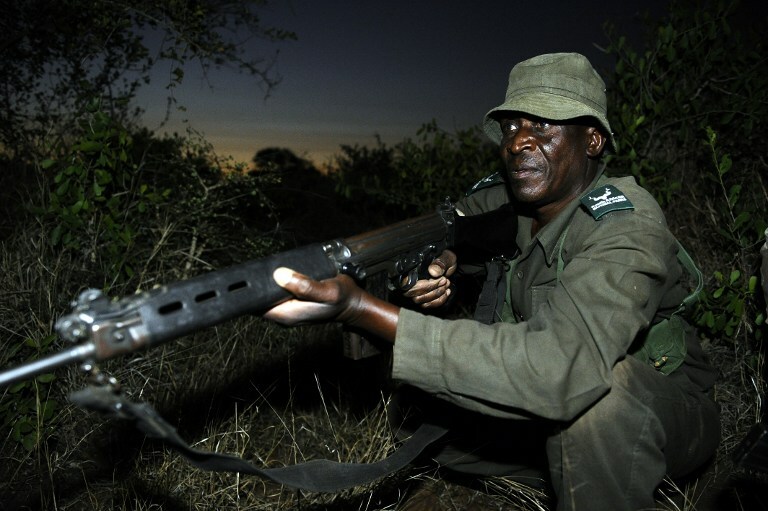 In some cases, they are managed together by both, providing efficient deployment against poachers. Our goals is to, eventually, manage direct operations ourselves in cohesion with transnational government agencies. By having sustaining fundraising programs for park rangers, we are able to ensure our mission and our vision to operate effectively in all our target areas. Along with business and corporate partnerships that we seek and maintain, we are able to raise funds and distribute resources equally to our program sites on a quarterly basis. You may also take part by supporting our programs below. Adopt-A-Ranger is our regularly sustaining (monthly, quarterly, or annual) program for those who truly want to get involved with park rangers in Africa. With the collaboration of park ranger agencies, a donor may choose to “adopt” a park ranger to give them complete (morale, financial, tactical) support on the ground. If you wish to adopt a bush ranger, please give us a holler and contact us and we’ll send you more information on how to help those who defend wildlife on our behalf. Created in memory of all wildlife park rangers killed in action or wounded worldwide, the R4R™ Fund will provide supplement funding to park ranger agencies to increase monetary rewards to witnesses who come forward for apprehension of poachers who injure and/or kill a park ranger. If you wish to support this special fund to help deter the injuring and/or killing of park rangers, please give us a shout and contact us and we’ll send you more information on how to be more committed to those who defend wildlife on our behalf.